“John was born in Fairlie in 1887, and attended Timaru Boys High School. After school he had a number of jobs, and moved to Australia for health reasons. 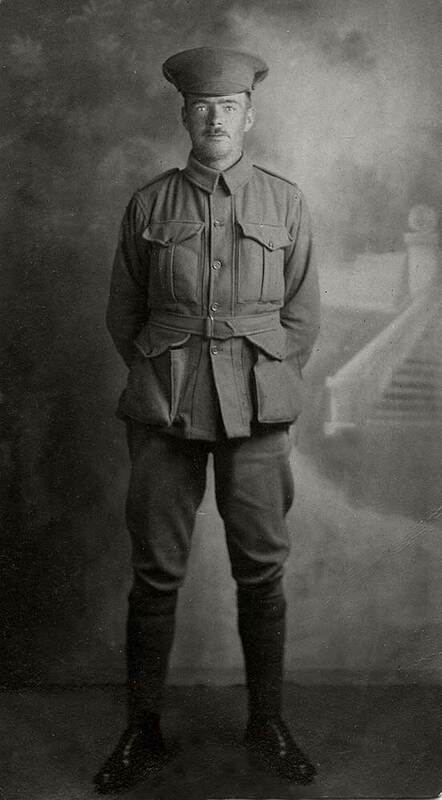 He enlisted at Rockhampton January 5, 1915 and was assigned to the signalling division, 4th Reinforcements of the 9th Battalion. He left Brisbane April 8, arriving at Suez on 13/05/15. He travelled overland by train to Alexandria, boarded a troop ship on 23/05/15 and landed at Anzac Cove on 27/05/15. His duties at Gallipoli alternated between sentry duty, sapping front line and support trenches, and running messages. JD made frequent visits to the NZ trenches to catch up with old friends from South Canterbury. He was taken off the peninsula with dysentery on 13/11/15 and recuperated on board a hospital ship until eventually taken to Alexandria. He rejoined the Battalion which had arrived from Gallipoli on 5/1/16 and participated in more desert exercises and signal school training until 06/06/16 when the Battalion was shipped to Marseilles and to the Somme. He was eventually wounded in Pozieres on 13/08/1 and sent to England for hospital treatment. He eventually returned to New Zealand and took up land at Enfield, North Otago. He married and had a family. JD kept a diary which was donated to the Alexander Turnball library and features in a display this year. His diary is being transcribed online at http://www.rootsweb.ancestry.com/~nzlscant/McLeod_diary_1915.htm and is also being posted in real time on Tumbr which you can visit here  http://johnduncanmcleod.tumblr.com/"